Ether 4 and 5 present Moroni’s conclusion to the awe-inspiring account of the Brother of Jared’s vision of the premortal Christ. 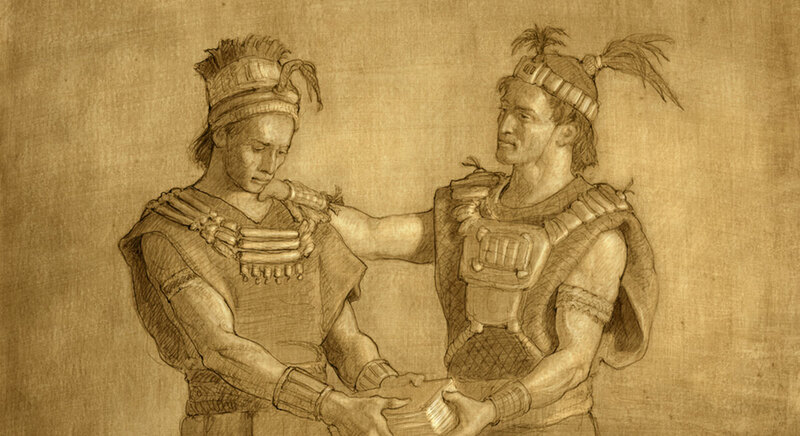 Moroni had a number of editorial comments to make to future Gentile readers of this account, including how they could prepare themselves to receive all that the Lord had revealed to the Brother of Jared. He wanted them to understand how they could come to believe in his words —and in the words of Christ—as well as what they needed to do in order to receive the blessings that were promised to believers. As he made these comments in Ether 4–5, Moroni repeated and made use of many of the themes and verbal expressions used by his father, Mormon. For example, Moroni wrote in Ether 4:11–12 that by the “Spirit he shall know that these things are true; for it persuadeth men to do good.” In Moroni 7, Mormon similarly had stated, “For behold, the Spirit of Christ is given to every man, that he may know good from evil; wherefore, I show unto you the way to judge; for every thing which inviteth to do good, and to persuade to believe in Christ, is sent forth by the power and gift of Christ” (Moroni 7:16). Furthermore, towards the end of his writings, Moroni again rehearsed these same principles: “And whatsoever thing is good is just and true; wherefore, nothing that is good denieth the Christ, but acknowledgeth that he is” (Moroni 10:6). The scriptures provide only a limited account of Moroni’s family relationships and focus solely on father and son, but the glimpses suggest a tie rich with natural affection, strengthened by mutual concern for the ministry. The very structure of Moroni’s writings reflects a profound respect for his father. His initial writings (Morm. 8 and Morm. 9) were intended to do no more than complete his father’s record. Later, when Moroni added his own book, approximately two-thirds of its space was devoted to a presentation of his father’s teachings and letters. Book of Mormon Central, “Why Does Jacob Quote So Much from the Psalms? (Jacob 1:7; cf. Psalm 95:8),” KnoWhy 62 (March 25, 2016). Cole Durham, Jr., “Moroni,” Ensign, June 1978. Moroni presents these words as a quotation from memory of the things Jesus Christ commanded him to write (Ether 5:1). Because the section quoted here is very similar to what Mormon wrote in his letter transcribed in Moroni 7, readers may speculate that either Moroni received a revelation from Christ that had previously been given (at least partially) to his father, that the revelation had originally been given to Mormon and Moroni simply took upon himself the instructions that Christ had given to his father, or that both Mormon and Moroni had been given similar teachings in the revelations that each had received. See also John Gee, “Quotations of the Sealed Portions of the Book of Mormon,” Insights 24, no. 6 (2004): 2–3. See Book of Mormon Central, “Whom Did Nephi Quote in 1 Nephi 22? (1 Nephi 22:1),” KnoWhy 25 (February 3, 2016). Regarding Nephi’s intertextual use of biblical passages, it states: “Far from slavishly and lazily copying the Bible, Book of Mormon authors, such as Nephi, conscientiously knit together strings of biblical phrases and passages in an intricate manner that expanded and re-conceptualized the teachings of biblical prophets. This phenomenon of a text recombining quotations, allusions, and paraphrases of other texts for new literary purposes is called intertextuality. It was anciently the mark of a fine scribe or author and is found explicitly and implicitly throughout the biblical books themselves.” See also Book of Mormon Central, “Why Does Nephi Quote a Temple Psalm while Commenting on Isaiah? (2 Nephi 25:16),” KnoWhy 51 (March 10, 2016); “Why Does Jacob Quote So Much from the Psalms? (Jacob 1:7; cf. Psalm 95:8),” KnoWhy 62 (March 25, 2016); “Why Do Certain ‘Treasured Words’ Appear So Repeatedly in General Conference Talks? (2 Nephi 25:26),” KnoWhy 69 (April 2, 2016); “Why Did Ammon Borrow So Much from Tradition in Alma 26? (Alma 26:8),” KnoWhy 133 (June 30, 2016). W. Cole Durham, Jr., “Moroni,” Ensign, June 1978. Durham, “Moroni.” See, Mormon 9:27–29; Ether 4:7, 11–19; Ether 12:23–41; Moroni 7; Moroni 10:4–23. Lucy Mack Smith, History of Joseph Smith (Salt Lake City, UT: Bookcraft, 1958), 81.